As I noted in my previous post using the free default Blogger iPad application produced by Google can be done but has severe limitations. Thankfully I'm now sitting at the very same table using a different 3rd party application (which I will describe in a moment) that makes Blogger on the iPad a joy to use. In fact, I may just end up using this app more than my laptop for future posts. This isn't the only Blogger iPad application, I'm sure. But, it comes to the top of the list when you search the App Store at Apple. Let me dive in deeper on this. The app I selected is called BlogTouch Pro (version 2.6.5) by Alexandru Denca. I had downloaded the free version initially but found immediately that the feature/functionality was so much greater than the Google tool that I just ended up buying it for only $4.99. The first thing I noticed was the full editor feature set that was sorely lacking in the Google tool. I mentioned in my previous article that the smaller font size in the Google editor was driving my eyes crazy and made it mostly unusable for an iPad Mini (a larger iPad would probably be ok). Well, right away I altered this post's font size and now have a very comfortable screen to view and type on. I really like that the editor also fills the entire window with a very clean look. The editor gives you the features you need to highlight, change font colors, use bold and italics, strikeout, super-subscripts and more. Of course, the standard paragraph formatting is available as well as image and video inserts which I'll cover next. Hyperlinking is also very easy if you want a valuable external link. However, if you're an expert on HTML you're really in luck because you can switch to HTML view and add any customizations to a post - awesome option! Using the image uploader is a dream compared to the Google tool. You get full control of the image to resize, justify and set the picture properties. Here is the example of this post being written from a picture I just took from my iPhone. I used a small utility to scale the photo down a bit and crop it (just as I would on my laptop). Then, I just pressed the image icon to insert it from my photo gallery on the iPad. After using this tool for a while I started to wonder about internet connectively while working. This iPad is Wifi only so it doesn't have a 4G option - what does this mean to editing and saving posts? Good news is that BlogTouch Pro has a Save Local feature that allows you to work in remote settings and not having to worry about connectivity - a great feature! You are given the option to save Locally, in Draft mode or to Publish. Draft and publish post to Blogger. I had no issues with multiple Google accounts - Blogtouch Pro can switch between them and the associated blogs so you can keep track of all your work. There are a few things that are not quite user friendly - such as having to manually hit the small refresh icon in the lower left to see the blog posts appear (you get a bit startled not seeing your posts when you switch). All in all I have found this to be an excellent iPad application for Blogger. I cannot say if there are limits or bugs to large images or complex posts since I haven't used it for very long. But, I've attempted a number of test posts without problems (other than my own learning curve). Frankly, you could really use this app to be a great notetaking complement since you can adjust fonts, pictures and posts the way you want and just use a private blog for the notebook. I will try it - I will try anything. The Google blogger app is perhaps the worst product Google has ever released and I use a lot of their products. Thanks for this article - i too use a mini ipad and found font size bearable but what was unbearable was the edit previous posts functions didnt seem to work (original ipad mini & IOS 8) . It is definitely worth the price. I actually find that BlogTouch Pro is a fantastic small word processor on iOS besides Blogger. It has local saving and great features. Enjoy! I just downloaded this, after reading your review. Hope it's worth the money. I was using POSTS but it seems it's being discontinued. BLOGSY also seems to be having some lil issues. BLOGGER official app is just damn horrible. I can't work out how to delete a post or how to edit a post after it published. Can you provide advice? 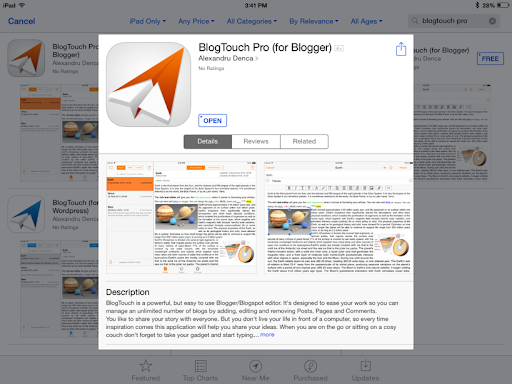 Are you asking in general or specifically for the BlogTouch Pro application on iOS? I use blogtouch pro as well and love it. However, I have to go to a PC and get on blogger if I need to fix a layout. 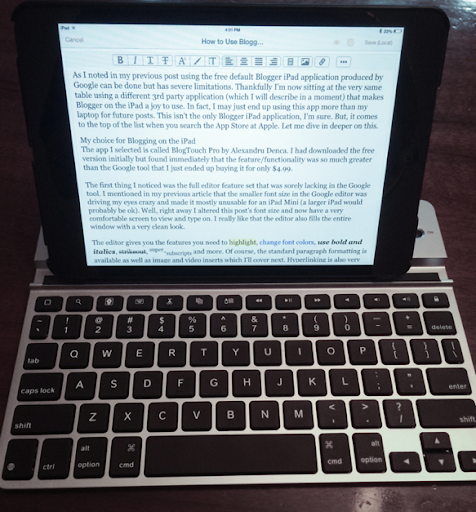 I hate Ipad pro no loner supports blogger but I do what I can do and BlogTouch Pro is worth the money. I love it for posting.